This year’s third America the Beautiful Five Ounce Silver Uncirculated Coin is no longer available. The collector coin featuring Blue Ridge Parkway in North Carolina had been listed on the United States Mint website as unavailable. On Thursday, the U.S. Mint officially declared they sold out. Sales kicked off for the 3-inch, .999 fine silver coin on July 7, 2015. Collectors grabbed 15,295 in the first six days. More recently, sales through Sunday totaled 17,454. Expect this tally to change slightly through the next week or two. Update: United States Mint sales figures through Nov. 2 have the coin up 34 to 17,488. The chart below was updated. 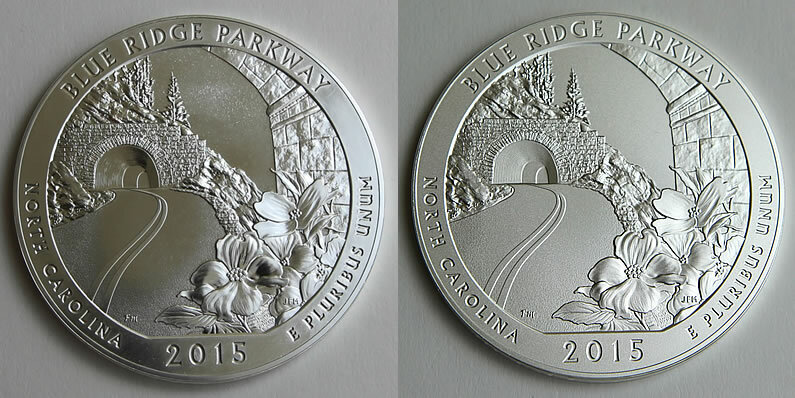 The U.S. Mint facility in Philadelphia strikes collector and bullion Blue Ridge Parkway five ounce silver coins. 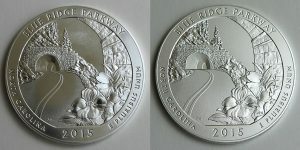 Both feature the same designs, which are larger versions of the companion Blue Ridge Parkway quarter. The bullion coins have a brilliant finish while collector coins have a matte uncirculated finish. The collector editions also carry the ‘P’ mint mark of the Philadelphia Mint. As it stands now, the 2015-P Blue Ridge Parkway Five Ounce Silver Uncirculated Coin has the lowest total in the collector series since the 2012 coin honoring Denali National Park in Alaska. That five ouncer ended with sales of 15,225. In contrast, the bullion version of the Blue Ridge Parkway coin ended with sales of 45,000, the highest of its product line since issues from 2011. Demand drives mintage ratios for the two types of coins, and they have changed. This year, it sharpened for the bullion coins yet weakened for the collectible uncirculated coins. The U.S. Mint capped the bullion to uncirculated mintages for 2015 at 65,000 per design. 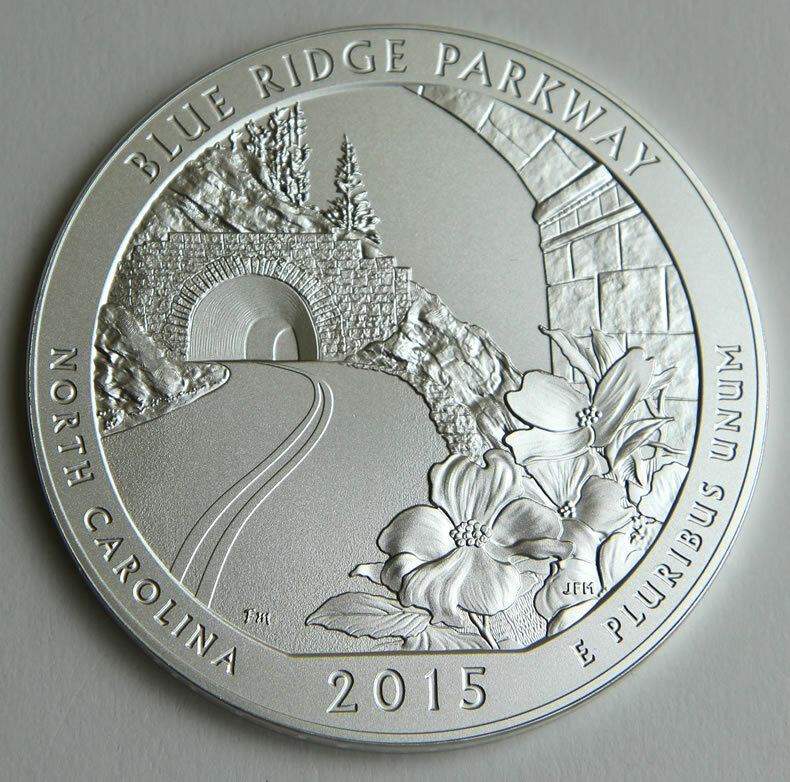 The combined totals for the Blue Ridge Parkway coins are about 2,500 shy of that limit. Had sales been stronger for the uncirculated coin following its launch week, the Mint would have likely produced the maximum. Four designs in the series of America the Beautiful coins have launched for 2015. The final design this year commemorates Saratoga National Historical Park in New York. The U.S. Mint will begin selling rolls and bags of the Saratoga quarter on Nov. 30, 2015. The bullion five ounce version is also expected to launch on the 30th. The collector uncirculated coin is scheduled for release on Dec. 3, 2015. Below are sales for the bullion and collector coins. Products with an asterisk (*) are no longer available. All collectible sales figures are unaudited as last reported by the U.S. Mint. I have seen some reports that the bullion Great Sand Dunes mintage was 22,000. Not sure if there is a way to check on that or not. And I guess 100 doesn’t make much of a difference. Thanks for keeping us up to date. Thank you for this update. I have seen different ” sale numbers” for many of the “collector” coins from the numbers cited here; however, as you state; “collectible sales figures are unaudited as last reported by U.S. mint.” When will there be audited “final sales”? Why does it take the Mint years to know what they have sold? David, confirmed. Thanks. The mintage is 22,000 for the Great Sand Dunes bullion piece. The table above is corrected. They’re probably well set up to count the number sold but I expect returns are more likely handled by hand and out of the system and as in any bureaucracy paperwork takes forever to process and by hand as well. Not an excuse and not acceptable in this day and age but a plausible explanation anyway. If they can not determine the number of returns for years sounds like there could be a “security” issue with such returns. Sounds just like the IRS mailing hundreds of refunds to one address. No wonder that the real U.S. debt is way over $100 trillion but they say it is “only” about $18 trillion. Like you say not acceptable. So what happened with the other 2500 blue ridge that were not sold in either category? That many defective? 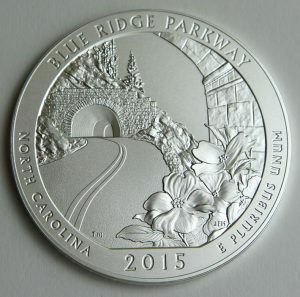 “The current authorized limit for both numismatic and bullion 2015 America the Beautiful Five Ounce Silver Coins-Blue Ridge Parkway is 65,000 coins across both options. An announced maximum mintage limit of 30,000 coins has been issued for the America the Beautiful Five Ounce Blue Ridge Parkway Uncirculated Coin. However, based on demand, the United States Mint has the flexibility to mint and issue more than the minimum of 35,000 America the Beautiful Five Ounce Blue Ridge Parkway Silver Bullion Coins so long as we do not exceed the 65,000 coin limit.” . … You mean the expedited the whole 65, 000. 00?